If your old, well-trusted GPU doesn’t handle your 4K footage that well anymore and you are constantly seeing dropped frames when you edit or do any sort of grading, maybe it’s time to consider a new and more powerful replacement. 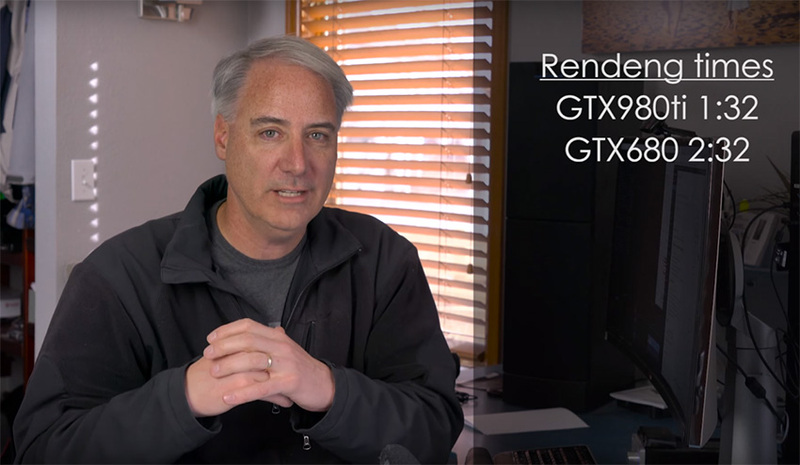 Recently, our friend Dave Dugdale from LearningVideo.com had the chance to test out the new GeForce GTX 980 Ti after swapping his old GTX 680 graphics card. He conducted a series of tests with the new GPU and the way it handles Red Dragon 5K Raw footage in real-time at full resolution. Dave also did a quick comparison in terms of performance with his old GTX 680 GPU as he reveals the results in the video below. It seems that the GTX680 wasn’t able to playback smoothly the 5K Raw footage in Premiere Pro CC with some colour correction effects applied on top, mainly due to the limited number of CUDA cores and 4GB of Video RAM it provides in comparison with the GTX980 model that comes with 6GB. In this particular one minute test, the GPU load goes up to around 90% as there were 350 dropped frames on the Red Epic 5K footage when play backed in Premiere Pro CC. Unsurprisingly, when Dave did the same test, but this time with the GTX980 Ti, the GPU load was around 60% and there weren’t any dropped frames at all during the playback. The memory usage of the GTX was around 2GB which was far better considering the fact that the GX980 Ti comes with 6GB of RAM. 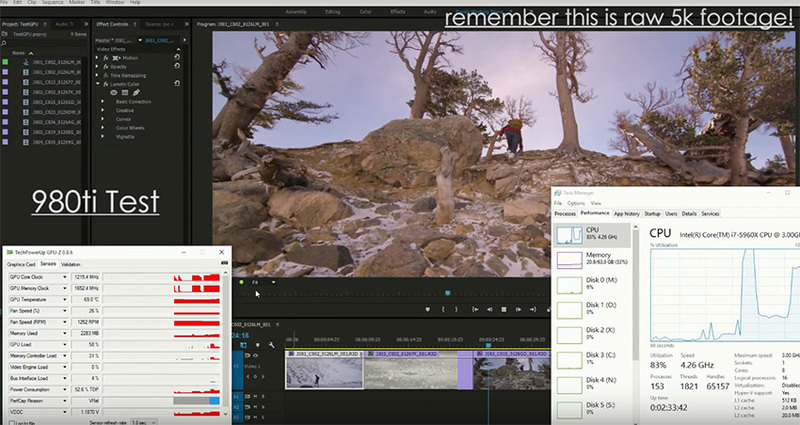 Yet, Dave points out that if you are mixing multiple files and codecs on the same timeline you might stumble upon dropped frames occasionally, especially if you are using effects or filters that are not CUDA-enabled, mainly due to the CPU overloading. Lastly, Dave tested the render times of both cards where the GTX980Ti managed to cope with the 5K Raw footage and rendered it for 1:32 where the GTX680 completed the same system-intensive task in 2.32. Ultimately, you should keep in mind that the GPU is not the only component that will affect your computer performance and editing workflow in particular. For instance, Dave utilizes Asus X99 Deluxe Motherboard, Intel i7-5960X 8-core processor, Crucial DDR4 64G 2133MHz, fast SSDs and other high-end components in conjunction with the GTX980 Ti. All in all, it’s safe to say that the other hardware components of your configuration are even more important, and if you really want to get the optimal results you really need to build a balanced system, thus avoiding potential bottlenecks that might influence negatively the overall performance of your system. If you are interested, you can find the full list of hardware components of Dave’s custom build “Monster” workstation here.